A Missouri grand jury has decided Darren Wilson, a white police officer who fatally shot unarmed black teenager Michael Brown in August, will not be charged. The police have yet again either killed a black man or allowed a non black man who did the killing to go free. What is statistically strange about today’s decision is this – According to the Bureau of Justice Statistics, U.S. attorneys prosecuted 162,000 federal cases in 2010, the most recent year for which we have data. Grand juries declined to return an indictment in 11 of them. Grand Juries are a rubber stamp, Former New York state Chief Judge Sol Wachtler famously remarked that a prosecutor could persuade a grand jury to “indict a ham sandwich.” That is of course unless the Grand Jury is deciding to indict a police officer, rarely does it even get to that stage, then the police officer almost always flips the statistics on their head and faces no charges. Now there is absolutely no point in me adding anything else, millions of column inches, radio reports and TV news stories will cover all the gory details. From the killing of Michael Brown, to the following riots, the travesty of justice and who knows what will happen next. Black child Ivins Rosier a 17 year old boy received 23 years in jail having been tried as an adult for killing a retired police dog. While the killers of Trayvon Martin and Michael Brown have walked free after shooting dead unarmed black boys. In Australia… cue the outrage! This would be perfectly acceptable, mandatory, inspiring even that from all this distance away thousands of Australian’s have taken to social media to express solidarity with Ferguson and disgust with the US justice system. But while Australian’s line up for this noble cause they are deafly silent as to the Black Deaths in Custody that occur right under their noses, right here, under another Red, White and Blue flag, in the United States of Australia. 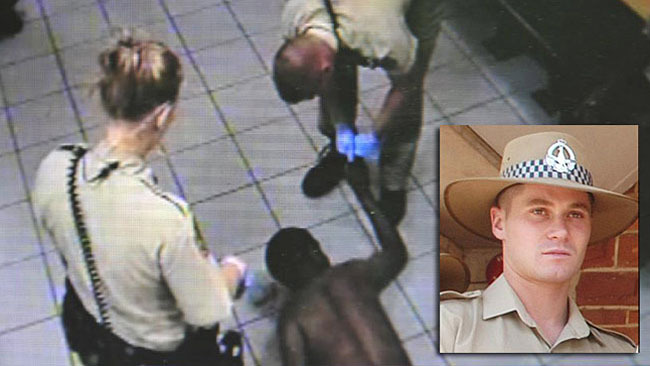 Tell me Australia, about the time you took to social media in your thousands and exploded with anger at the death of Mr Briscoe (Pictured above) at the hands of Police in Alice Springs. You can see if you wish reporting on this website, that highlighted the case, that showed Mr Briscoe slowly dying in a cell, that showed his head being smashed into a wall and which showed his blood being casually cleaned up with an officers foot. Or you can read about Ms Dhu, dead at the hands of police in WA while in custody for a few unpaid fines. Who begged and pleaded to see a doctor, yet died an agonising and needless death. Also from WA you can read about Mr Ward an Aboriginal elder from the Ngaanyatjarra lands in Western Australia, who having been driven a total of 922km in a boiling hot prison van literally cooked to death. He was a artist, a lands right activist who visited China as part of a delegation, a skilled hunter, an interrupter and assisted scientists in conservation. He’s dead at the hands of the justice system for a crime he was alleged to have committed that would have resulted in no more than a fine. In NSW young TJ Hickey was chased by police to his death and died impaled on a fence. Witnesses believe his bike was clipped by a police car, police say otherwise. No action was taken. In Queensland on Palm Island, Mulrunji would become the 147th Aboriginal person to die in police custody in just 14 years. They were the 14 years that had followed the Royal Commission into Black Deaths in Custody. Mulrunji had been arrested for causing a public nuisance, allegedly, but died a short time later when his liver and spleen were ruptured in two at the hands of police. Back in WA Aboriginal man Marlon Noble served 10 years for a crime he didn’t commit, in fact he never even faced trial, he was simply held, imprisoned and warehoused like perished goods. There are countless other cases, by countless I mean hundreds in the last 30 years, each and every time the Aboriginal community fight for justice. Each and every time communities are left without justice at the hands of the justice system. These incidents didn’t happen in Compton or Atlanta, in NYC or the Southside of Chicago. They didn’t happen in rural Texas, inner city Memphis or in the backwaters of Georgia and they certainly didn’t happen in Ferguson. They happened in your country, in your state, in your city and under your version of a flag wearing Red, White and Blue. The officers here, like the officer from Ferguson have never faced Justice. The Black community here, like the Black community there have begged, pleaded, lobbied and advocated for Justice. Both communities have been failed. …. Well that’s on you! Posted on November 25, 2014, in Uncategorized. Bookmark the permalink. 28 Comments. considerind ATSI make up only 10% of the entire Australian population and over a quarter (27%) of people in correctional facilities are ATSI we have the highest amount in the world for indegious people in goal. What does that tell you? I will let you figure that one out. Actually John according to 2011 census we only make up 3% of the total population 669,000 of us. One of the main reasons that Ferguson has exploded worldwide the way it has is because so much of it has been recorded and shared via social media. It’s easy to click onto a livestream and watch things happening in Ferguson; the same can’t be said for most of these other (terrible) cases in Australia. We need a way to keep an eye on our cops, because we definitely do still have a racism problem here; I’m just not sure how. John Smith, what it tells me is that ATSI people are disproportionately pursued, arrested and charged for public order offences for which other people merely get warnings (if that), and that ATSI people are disproportionately given custodial offences where other people get good behaviour bonds, and that ATSI are disproportionately the recipients longer custodial sentences – all these factors skew those statistics. Look at what the ATSI people who died were arrested for in the first place. Can you imagine any white neighbour of yours who might walk home from the pub a bit drunk sometimes, or maybe spits out some phlegm on the street, or who fails to pay a few fines, actually ever being arrested for it, let alone spending time in prison for it? why you say?? Because everyone knows we can’t!! We’ve been trying ever since these people settled in our country and for what?? More and more of our people are suffering and dying everyday because the black are black and the White are white!!! Us blackfellas are waiting for handouts and promises made everyday because that’s how they’ve made us think!! And when you do that what do you expect people to think??? By the way tigtog and John Smith, we are First Australians or Aboriginal and/or Torres Strait Islander. We are not ATSI, it’s disrespectful to our mob. Us blackfellas have been waiting for proper justice for decades and see promises fulfilled for health, education and employment where it’s needed, not be just some political tool to be awkwardly used by people in power. John Smith writes “What does that tell you? I will let you figure that one out.” It tells me that they have a far higher rate of crime. The statistics show that. And BlackForce, there is nothing wrong with saying ATSI. But if you want to use it as an excuse for being offended then go ahead. There are bigger issues facing the ATSI community. People are rushed these days and often have to use short hand expressions when tapping in their keyboards. Its called educating yourself. We’re not ATSI we are human beings just like you. Kashilchan said “We need a way to keep an eye on our cops, because we definitely do still have a racism problem here”. Are you aware that Aboriginal people are far more likely to be hurt/killed by other Aboriginal people than by cops? Tlgtag, you have a very unbalanced view. Are you not aware that Aboriginal people jail are mostly there in for violent offences? Those who do go to jail for minor offences typically pass through very quickly. Did it not occur to you based on the appalling violent crime statistics that high rates of crime are the leading cause for high incarceration rates. And yes, I can imagine white neighbour of yours who might walk home from the pub a bit drunk sometimes, or maybe spits out some phlegm on the street …. Actually your facts are totally incorrect. Why don’t you educate yourself if you intend to speak about issues such as Aboriginal incarceration. 80% of Aboriginal people are in prison on minor offenses mostly traffic related offenses. You can get these stats online you only,have to do some research instead of assuming you know what your talking about. You can get order this book online you only,have to do some research instead of assuming you know what your talking about. You really should educate yourself BlackCard and come to terms with some facts that you may be uncomfortable with. Not at all Zane. I just think people should know where the real problems lay. Certainly pursue justice when a police officer does wrong, but let’s not be under any illusions about where the most beatings come from. I am not sure how you reached the conclusion that “because 27% of inmates are black that gives the right for law enforcement to do what they want”. The black guy who got shot, had literally minutes before, robbed a store and choked the clerk. Dude was about 6’3 or so and a nice hefty build. Police officer stopped him. The guy charged the officer they fought, the guy tried to grab the officer’s gun a few times, beat the officer up and left, the cop got back up and told him stop, and he turned around and charged the officer again, the officer opened fire. Dont be retarded. Yes, there are issues in Ferguson with improper police action etc. However, this case was not one of those times. Sorry. Turtle and Stop Race Baiting, it is a shame you have both joined this conversation and left facts behind as you entered. Turtle your “statistics” on Indigenous incarceration are so inaccurate it would be laughable if not for the fact you actually believe them to be true. This is one of the very reasons that Deaths in Custody take place, a public who believe they know what they are talking about but are horrendously ignorant. Your comments about violent crime are completely inaccurate. Of the cases I mentioned not one of the individuals who is now dead was ever charged with a violent crime nor were they ever found guilty of any crime what so ever. Please get your facts straight. And people do not “pass through the system very quickly” Read up on remand stats and then return to this post. Stop Race Baiting, your name alone suggests your are a barely functioning idiot, which is a shame. I’m sure you are capable of much more than looking around the internet as to where to post offensive comments. Sadly like Turtle you left facts out of the way. Apart from the officer and Mr Brown who is now dead, despite being unarmed he was shot multiple times. There is only one witness who saw the whole event take place and there is no video as you suggest. That witness gives a completely different story to you, one that is far less favourable to the police officer. Again, check your facts and then come back, reference them with accurate sources. It is unacceptable that a young man is killed and the best you can do is pluck facts from your behind to attempt to back up your predetermined ignorant and racist views. You should be ashamed! Lmao but you can’t deny or debate the facts. As far as a screen name being a good indicator of intellectual prowess, you really show your mettle when ad hominem attacks are your response instead of debate. Why not prove your case since your article failed to state any facts of the case and was written purely from an emotional standpoint. As far as trolling for somewhere to put offensive posts, might be the most ignorant thing I’ve read here today. You explain how stating the facts of the case and being against the racial division lines counts as trolling. When you can do that, and from an intellectual standpoint, I’ll go ahead and pretend you’re not the drooling mongoloid ignoramus you are currently coming off as….. just noticed you referenced my racist agenda… IM NOT WHITE. Nice try. “ad hominem” Really? What were those? Let me know and I will correct them. Can you be specific (and not be a wus) and tell me exactly what it was (just copy and past) I wrote that you object to. Can you please point the inaccurate statistics refer to? Can you give me an example of the ‘race baiting’ you refer to? And thank you for your comments about my screen name. I am not sure what that has to do with this discussion but thanks anyway. How long should I wait for you to ‘correct’ me and point out my ‘errors’? 1deadlynation, what facts need clarification? MurriMan, rather than be vague, can you be specific and give some examples of the ‘untruths’ spoken here? As a white man, I would consider each death mentioned was totally unnecessary and nothing more than murder by the people who are supposed to protect us!!! John, How does the death rate of Aboriginal people in communities compare to the death rate of Aboriginal people in jail? How does the death rate of Aboriginal people in jail compare to the death rate of non-Aboriginal people in jail? Even though I am a white of Anglo-Saxon heritage it has long annoyed me that such an overwhelming majority of our police, in every State, are also, white and of Anglo-Saxon background. I have had a number of perceptive visitors from overseas over the years who have remarked that the ethnic composition of our police forces does not seem to be in any kind of reasonable balance with the multicultural makeup of our modern society. When was the last time your were (say) breathalyzed by an Aboriginal, or Asian, or African or Middle Eastern police constable? It is so ludicrous; I can’t even name an instance in my entire 40 years in Australia when I was spoken to by a policeman with a Kiwi accent – an accent which always makes me smile as I came to this country from NZ in my early 20s and I’m now 66 and every phone chat with my beloved sister ‘back there’ invariably tickles my funny bone. Five years ago the well-built, very personable and highly intelligent son of a respectable Anglo-Asian family I know well finally achieved his dream – a formal acceptance into our State police force. This young man already has an accounting degree from our local uni but had long dreamed of becoming a detective one day. What an asset he would make – with that degree, a fluent speaker of English and Thai and superbly fit with it. Yet for 5 years our police managed to keep him out of the State police academy under one pretext or another. They only caved in recently, I believe because (a) they had finally run out of excuses, and (b) senior police management are slowly beginning to see the writing on the wall….